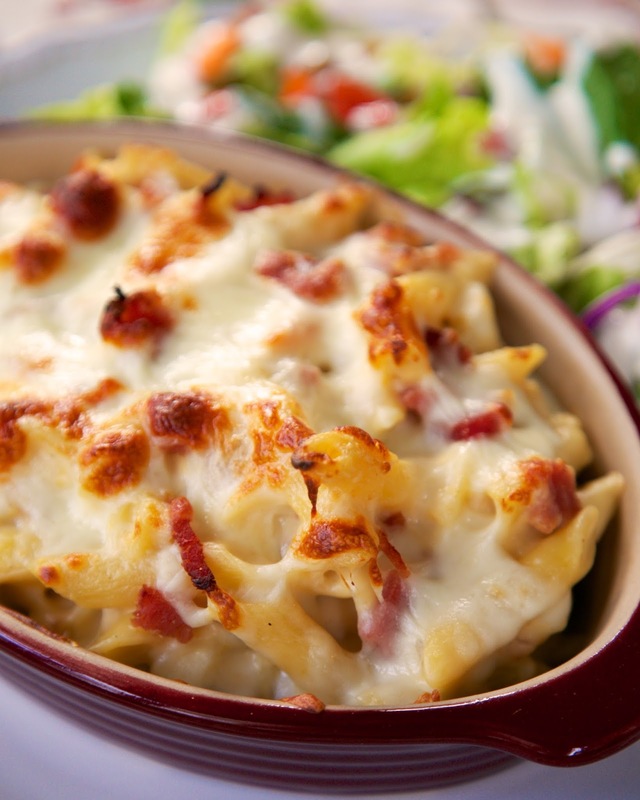 When we ate at Bottega Cafe recently, we kept seeing the Cafe Mac and Cheese go by. I went home and found the recipe. I couldn't wait to try it! I decided to add some ham to the mac and cheese to make it more of a meal. I served it with a salad and we had dinner. 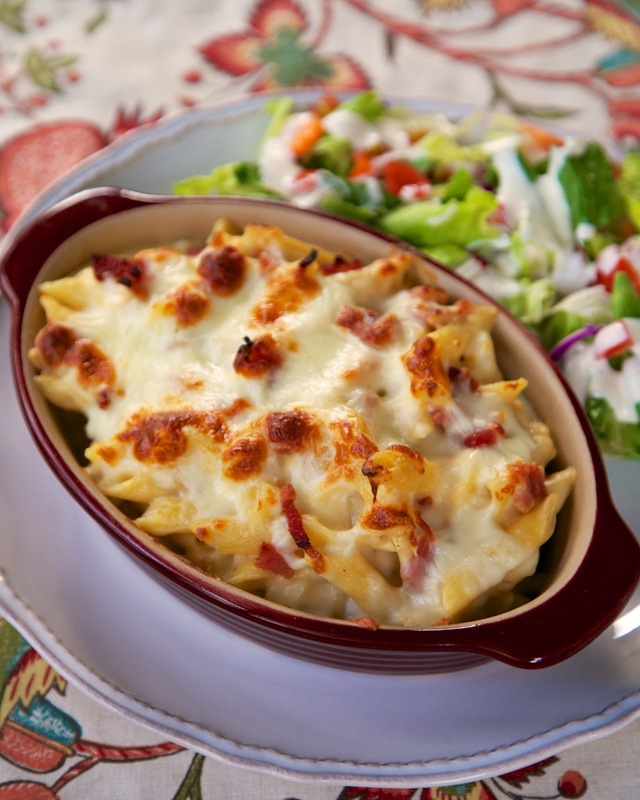 The mac and cheese is made on the stove and popped in a hot oven to brown the top layer of cheese. The mac and cheese is packed full of great flavor. I loved the combination of cheeses. It was ooey, gooey delicious! In a large saucepan, combine milk, onion, bay leaves, salt and pepper. Bring just to a simmer over low heat and simmer for 15 minutes, until reduced by 25%. Strain milk and set aside. Melt butter in saucepan. Whisk in flour and cook for 3 minutes on low heat. Slowly whisk in the milk. Add Worcestershire and hot sauce. Gradually add yellow cheddar cheese, white cheddar cheese and Parmesan cheese. Whisk until all cheese is melted. Remove from heat. In a large bowl, combine sauce, pasta and ham. Stirring to toss. Pour mixture into a lightly greased 9x13-in pan. Top with provolone cheese. Bake 8-10 minutes, until cheese is melted and bubbly. I never would have thought to include Worcestershire sauce. Can't wait to try this! I cannot wait to try this!! It sounds great! I love a good mac n cheese recipe! I've been in Birmingham almost a year and I still haven't been to Bottega -- what in the world? !